Conn Ryder. Fabulous color and movement. I love the fluid brush strokes and those pops of colors with an otherwise subtle background. This Colorado artist gives it her all and it shows! I love the story about her high school art class… so true! What a great instructor! Check out many of Conn’s fabulous paintings on her website (kudos on the website too!). Conn Ryder was drawn to and garnered praise for her art from an early age. But it was an incident during a high school drawing class that expanded her way of thinking about art. Assigned to create a pencil drawing of a shoe, Conn sorted through a box of old shoes and, after choosing a clean white Keds sneaker, tied the laces in a neat bow and began sketching. Noticing this, her teacher lunged toward her desk and heaved the sneaker across the room where it hit and bounced off the wall. He wildly dug through the box of shoes, eventually pulling out an oversized, raggedy, high-topped basketball shoe with the tongue half ripped off and shredded shoelaces. He slammed the tattered shoe down in front of Conn and said “Draw this! This shoe has character!” Conn created the best drawing she had done to date and received an A+ for her efforts. More importantly, she walked away with a lesson in seeing the character, interest and beauty in the least obvious places. Conn studied fashion illustration at the Art Institute of Fort Lauderdale, and later studied painting at the Kansas City Art Institute. One day during college, Conn’s instructor led a group of art students into the painting studio to show them a large vibrant abstract Conn was working on. The instructor pulled the painting out of the storage slot, only to discover the previously colorful canvas had been covered with thick, black paint. Conn later explained that out of frustration, she painted the entire surface black, and in doing so, freed herself from the creative fetters of the previous image. The next afternoon, she feverishly scraped back into the black surface, reworking areas as she went and uncovered a more complex and texturally varied abstract that suited her sensibilities. The instructor said she knew then that Conn was a true artist. Conn later turned to representational painting with a focus on oil portraits and still lifes. During that period, she studied with Daniel E. Greene, Joan Potter and Robert Vaughn. But as other aspects of her life began to take over, Conn’s artistic pursuits became sporadic at best or placed on the back burner altogether. Though the course of her artistic evolution zigzagged through fashion illustration. 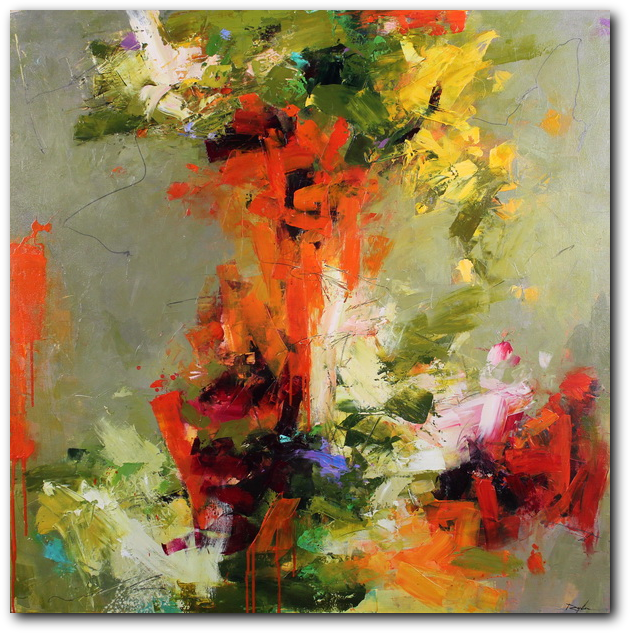 representational art and at times was suspended, by 2008 Conn found her way back to the abstract painting that resonated in her core. Since that time she has painted with increased dedication to cultivate her own unique artistic voice. Her work has been included in regional, national and international juried exhibits—most recently the prestigious 2014 Governor’s Art Show in Colorado. Conn draws inspiration from the experiences of her life, from the music that stirs her, from the landscape that surrounds her. . . and most of all from viewing everything in her life with raggedy-shoe awareness. House Plan: TNH-GC-09A (Katrina Cottage 480) by Moser Design Group! Conn Ryder rocks. It’s gratifying to see her featured, and is a testament to your own good taste. Keep finding wonderful lesser known artists!